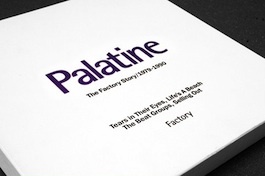 * Generic Factory 'Pre-Release' custom sleeve; ink-stamped with catalogue number, title and 'Palatine' (each element stamped separately). ** Plain white sleeves, ink-stamped with catalogue number and/or title and/or ‘Palatine’ (each element stamped separately). *** Custom sleeves. Jewel-cased, but not boxed. Sleeves and labels printed in a solid metallic colourfield that matches colour designations of final art. Notes: Boxed set consisting of FACT/D 314 + 324 + 334 + 344 + 36-page colour booklet. The booklet (see also FAC 345), and a free video (see FACT 400V) also carries the catalogue number. The booklet includes a shortlist of 'all' Factory UK and Benelux numbers. Mistakes, misspellings (and/or typos), mis-titles and contradictory release dates lessen its reliability. FAC 400 was also allocated to a promotional issue video of the Joy Division 'Transmission' clip.